A true survivor knows that the more weapons you have in your arsenal, the better off you are. Professional knife throwers know the same ideal to be true. Arm yourself for competition or the apocalypse with the Biohazard Drop Point Throwers Set. 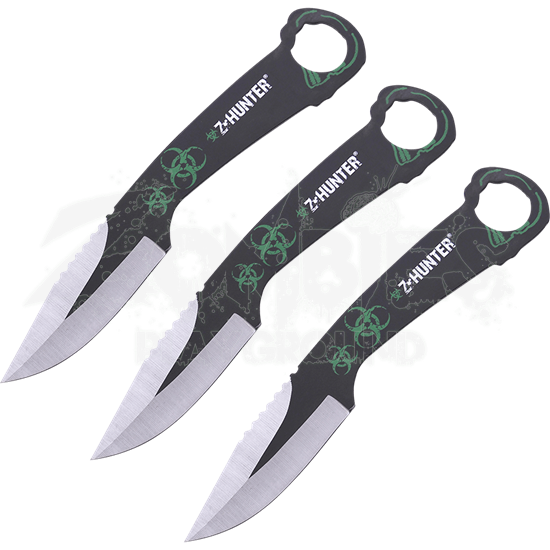 More than your typical throwing knives, this trio of blades offers additional utility. Crafted from stainless steel, this set of three knives features serration at the base of the blade and a finger ring on the handle. A green biohazard symbol is featured on the handle, giving them a look that shows they are ready to be used in a time of nuclear chaos. With a nylon sheath included, your Biohazard Drop Point Throwers Set comes with everything you need to be victorious, either professionally or recreationally.